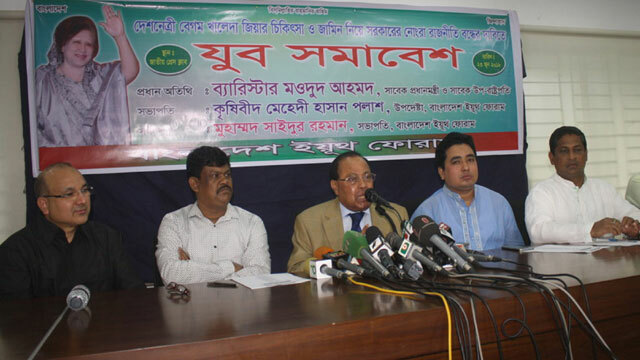 Dhaka, Jun 23 (Just News): BNP Standing Committee Member Moudud Ahmed today termed the Gazipur City Corporation polls as an acid test for both the government and the Election Commission and warned the government of dire consequences if ‘Khulna-style’ election is held there on Tuesday. "The Gazipur election is an acid test for both the government and the Election Commission. We'll closely observe their activities," he said while addressing a programme at the National Press Club in Dhaka. Youth Forum, a pro-BNP platform, organised the programme demanding immediate and unconditional release of BNP Chairperson Khaleda Zia from jail and her proper treatment. On February 8, a special court sentenced the BNP chief to five years' rigorous imprisonment after she was found guilty in Zia Orphanage Trust corruption case and since then she has been staying in the old Central Jail at the capital’s Nazimuddin Road. Claiming that there is a huge public support for BNP's electoral symbol "Sheaf of Paddy" in Gazipur, Moudud said, "We would like to say clearly that the consequences will be awful if Khulna-like election is held in Gazipur." After sensing result of the Gazipur City Corporation election, BNP will finalise its decision on joining the upcoming elections to Rajshahi, Sylhet and Barisal city corporations, Moudud said. The elections to the three city corporations will be held on June 30. The elections are very crucial for the ruling Awami League and its arch-rival BNP as these local body polls appear as an acid test for both the camps ahead of the national election. Moudud said only four months are left before the next general election and called upon his party men to build a strong resistance against the misdeeds, repressive acts like extrajudicial killings, enforced disappearance and filing of false cases against the BNP men by the government. "We must regain our strength and get united to build a strong resistance against the government’s misdeeds and mismanagements," Moudud said, urging the people of all walks of life to forge a strong unity to “restore” democracy in the country. About Khaleda Zia’s release, he said the BNP chairperson will come out of jail on bail and join the next election, no matter what evil efforts are being hatched by government. Awami League may try to foil the next general election, fearing of losing power and facing public wraths for its acts of misdeeds and corruption, he added.